240 pages | 47 B/W Illus. Software has become essential to the functioning of cities. It is deeply embedded into the systems and infrastructure of the built environment and is entrenched in the management and governance of urban societies. Software-enabled technologies and services enhance the ways in which we understand and plan cities. It even has an effect on how we manage urban services and utilities. Code and the City explores the extent and depth of the ways in which software mediates how people work, consume, communication, travel and play. The reach of these systems is set to become even more pervasive through efforts to create smart cities: cities that employ ICTs to underpin and drive their economy and governance. 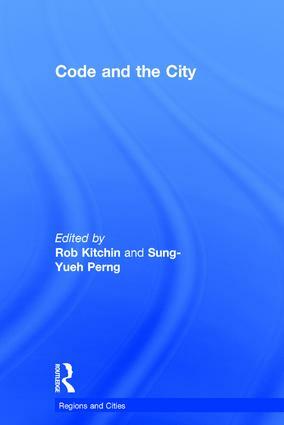 Yet, despite the roll-out of software-enabled systems across all aspects of city life, the relationship between code and the city has barely been explored from a critical social science perspective. This collection of essays seeks to fill that gap, and offers an interdisciplinary examination of the relationship between software and contemporary urbanism. This book will be of interest to those researching or studying smart cities and urban infrastructure. Rob Kitchin is Professor and ERC Advanced Investigator in the National Institute for Regional and Spatial Analysis at the National University of Ireland, Maynooth. Sung-Yueh Perng is a postdoctoral researcher on the Programmable City project at the National University of Ireland, Maynooth.